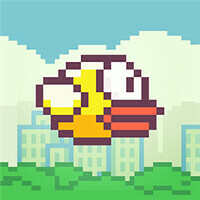 A report from security expert McAfee says that 80% of the Flappy Bird clones tested, contained malware. For those who were in a coma earlier this year, or somehow missed the whole Flappy Bird craze, we are talking about a simple but highly addictive game. Borrowing heavily from Super Mario Brothers, Vietnamese developer Dong Nguyen spent three days putting the game together, and was soon generating $50,000 a day in revenue. Instead of letting Flappy Bird mania run its course, and making a quick million dollars, Nguyen felt that the game was too addictive and pulled it from all app stores. But that left countless players in Flappy Bird withdrawal, a problem solved by third party developers who quickly knocked off the character and the game play. The problem is that a high percentage of these clones contain malware, according to McAfee. And because of the open source nature of Android, most of these infected Flappy Bird clones are found on apps made for Android phones. One of the most common events caused by the malware, are phone calls made without permission. Brian Kenyon, chief technical strategist at McAfee, said that these calls go to premium numbers that charge extra "much like the chat numbers that had a huge impact on people's phone bills a few years ago." Texts are also sent to SMS addresses that collect money. In addition, the malware gives away the user's location, which is helpful when a zip code is required to pull a credit card scam. Nguyen has talked about bringing the original game back, which just might put the infected clones out of business. I hope you do realise the article did not mention anything about it being on android. And if you do bother to click on the article before posting something like this, the article mentioned it happening on iOS too. "most of these infected Flappy Bird clones are found on apps made for Android phones" …Did you even "bother to click on the article before posting something like this"? and did you "bother to read his comment before posting something like this" ? He never said iOS has more malwares he merely said such malwares existed on ios too. Don't fee the troll man. hipnotika is a known hater of android. A pathetic one at that. Because it never gets popular apps. WP never had the real deal in the first place. McAfee itself is no less then a malware. McAfee is a bloatware in my home sync. Despicable!